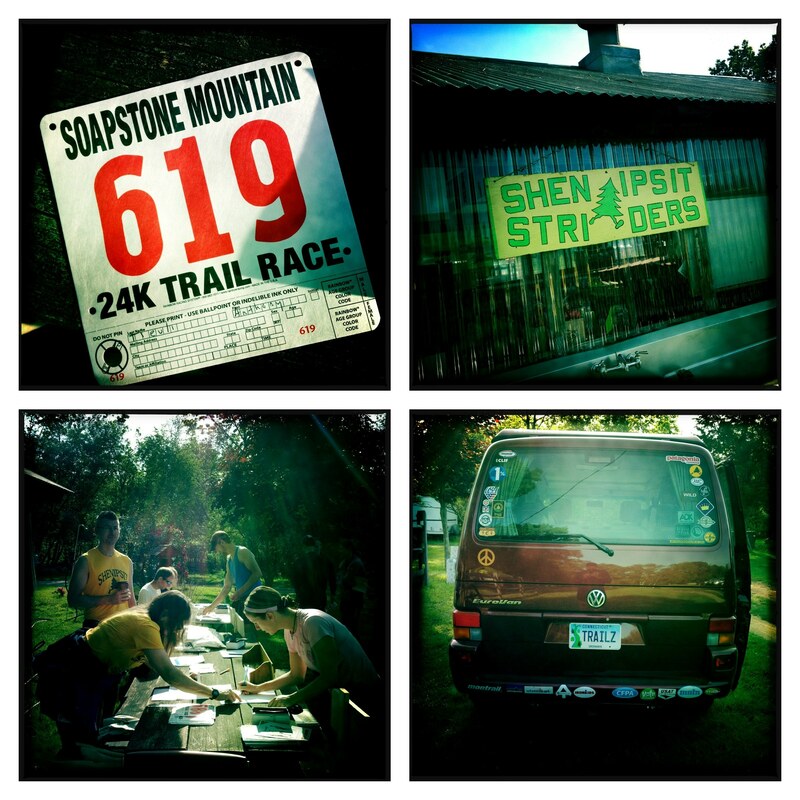 A few shots from the 2012 Soapstone Mountain Trail Race. With Pineland coming up soon, I’ve been getting a little anxious about giving my foot a legitimate test to see how it holds up in race conditions. Going back to the orthotics (in new Brooks Cascadia 7’s) has been working out great so far, but I was still a little nervous about how it would hold up over 31 miles. With only one weekend left to train, it didn’t make much sense to do excessive mileage on my long run, so I decided to register for this week’s Grand Tree Series race which was the Soapstone Mountain 24k trail race. At just about 15 miles, it seemed like a good distance for the last long run before a big race. Also, everything I could find online about Soapstone said that it was very tough with nearly the entire course being technical and hilly. I figured this would make for a great test for the foot because the rough nature of the course would over-work my foot which is at it’s worst when the course is technical. If I handle Soapstone okay, I’m thinking I should be good to make it through Pineland. It didn’t take much to get my friend Katya on board to come do the race with me. She typically runs long on trails both weekend days anyway, so when I mentioned it, she was all in! The race is in Connecticut, just south of the MA border off of I-84, so I left the house about 6:15 for the hour long drive. The race didn’t start until 9am, but being the paranoid early bird that I am, I arrived at 7:30 to get my registration packet. (and to make sure I got a t-shirt in my size of course!) I got my stuff, bummed around a bit, met up with Katya, and before I knew it, it was 9 and we were off! The race starts with a slight downhill on a fire road to stretch your legs out on. This goes on for just under a mile, and then runners take a left into the woods. That’s pretty much the end of smooth running until the end of the race! Roots, rocks, muddy streambeds, long slow technical climbs, and quick rocky descents. That’s pretty much what we ate all morning long. The most daunting climb comes at mile 2. A right turn faces you straight up the mountain where I looked up to see an endless string of “runners” climbing the steep singletrack hand over hand through some pretty thick vegetation on the hillside. About 1/3 to 1/2 mile of this slow climbing gets you to the top of what I’m assuming was Soapstone Mountain. We then passed under a fire tower and immediately down the other side losing all elevation gain in a fast, twisty, boulder strewn singletrack descent. With the biggest obstacle out of the way, the task of navigating the remaining 12 miles of the course was at hand. I really loved this race as a whole. My only real issues were not being smart about taking a hammer gel early enough, and managing the pain in my foot. The good news on the foot is that I had absolutely no Plantar Fasciitis pain at all! Not to beat a dead horse, but given the technical course, this is a huge breakthrough! The only “but” is that I’m dealing with some arch pain from the orthotic in that same left foot which I don’t really remember dealing with before. I’m hoping that the muscle is just weak due to the months of PF. This pain, however, is much more manageable than the PF. It seems to drastically respond to adjustments in how tight or loose my laces are. Somewhere around mile 5 or so, the arch was beginning to get particularly painful. I stopped and tightened my laces and the pain gradually went away allowing me to run the remainder of the race comfortably. As I started to mention before, I really should have taken a gel around the midpoint of the race. I blew it though, and didn’t take one until around the 11 mile mark when I was really starting to feel bonky. The rule of thumb is to take it before you feel like you need it, so I screwed that one up. The gel quickly helped me feel better though. I pushed through the last few miles of the race which included a short (maybe 1/3 mile) stretch of paved road and one last climb back up the fire road that we started on. There’s one last right turn into a very short singletrack section (where I managed to pick off a couple of runners! ), before coming out into the field and up to the finishing chute. I finished in 2:41:38 which works out to about 10:52/mile if you trust that the race coordinators have accurately measured the course to 24km (14.88 miles). This was good for 80th place out of 170. Not too bad! Katya did very well finishing in 3:04:00 and taking 2nd in her age group! 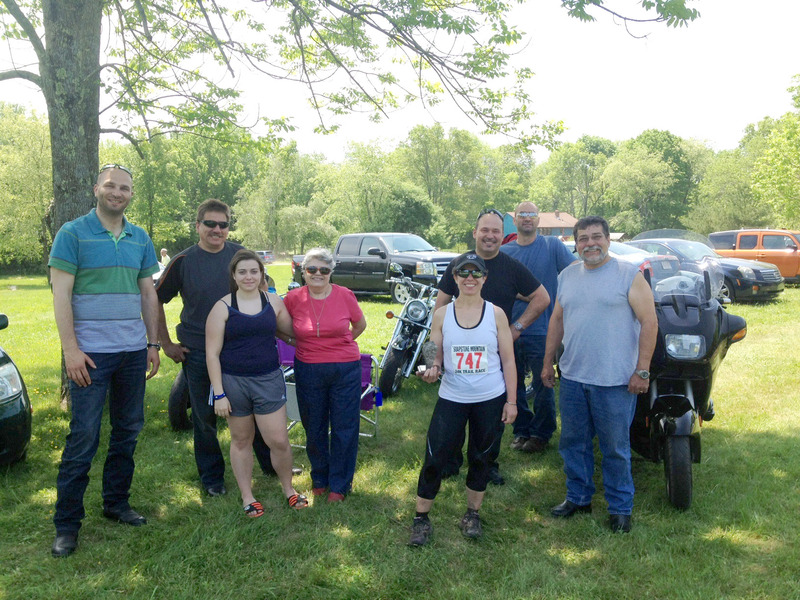 Her husband and his friends surprised her by showing up on their motorcycles to see her finish. Katya’s showing off her trophy and her entourage after the race. All in all, this race was a lot of fun and left me feeling much more confident for my next attempt at finishing a 50k next week at Pineland. I’ll definitely be back for this race again in the future! ← TARC Spring Classic 2012 – My first 50k and my first DNF. Both on the same day!